With Zircon-Brite, Saving Steps, Saving Time and Saving Money – As Usual! When you adjust a porcelain or Zirconium unit, do you then send it back for re-glazing for the area that was adjusted? If you are still doing this, then you need to know about Zircon-Brite. When you are making partial dentures, there are so many steps and changes of workstation that take place with conventional methods. We have worked out a faster and simpler way to make partial dentures without ever having to go through steps of adding and removing wax. ‘Perfect Pours’ specialty formula is the ultimate in color-stability and ranks extremely high in all pertinent measures. Customers have reported that Perfect Pour offers outstanding flexural strength, lack of porosity and increased polishability. 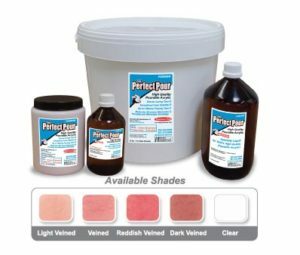 Perfect Pour is available in four life-like shades plus a clear for those laboratories fabricating bite-plates and night-guards. Clear is also great for labeling any type of acrylic appliance. All colored shades can be mixed to create custom shades as needed. Perfect Pour is currently offered at the most economic prices. Available in one-kilo (2.2lb) starter kits and ten-kilo (22lb) value kits. Gurus, geeks, mavens, maestros, aces – our clients tell us we’ve got polishing and finishing down cold. One of our specialties is coming up with time saving and money saving methods of expediting the polishing steps in the dental lab.